Choose “Spring Cherries” for Adults 21+ ONLY(wine available for purchase). Each participant gets a step-by-step tutorial from a professional artist on how to paint each section. Singles, Families, and Friends are all welcome! 50% of the proceeds go to Avenues SLS. 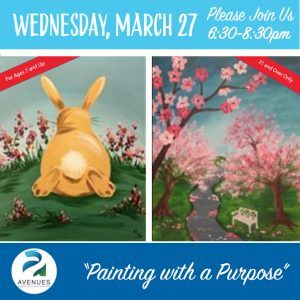 By joining us for a fun night of painting you will be supporting our fundraising cause.